Join several staffers from TheOneRing.net next weekend for the last big TORn hosted event of the year. 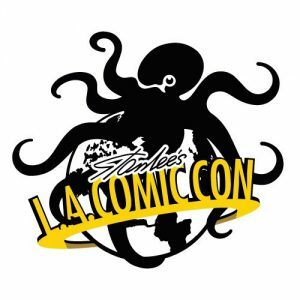 We will have a panel at Stan Lee’s Los Angeles Comic Con on Saturday, October 28 at 10am, room 403A at the LA Convention Center. Our panel is titled “80 years in Middle-earth, why Tolkien is still so relevant” and will cover several of the themes Tolkien uses in his stories, and discuss some of the many tangible ways Middle-earth is still being brought to life. We have a sneak peak at the new Shadow of War game and some more casting rumors for the Tolkien Biopic in the works. And best of all, they’ve given us 75 minutes to talk, rather than the regular 50 minutes we normally get, so maybe a little Tolkien singalong is in order. Tickets and schedule information can be found at the Convention website and you can let us know you are coming at our Facebook Event Page by RSVPing. Calling all LEGO fans! 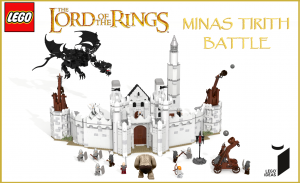 Would you like to see the Battle of Minas Tirith as a LEGO Set? Well here’s your chance to let LEGO know. JediPippin has sent us his concept images that he has submitted to LEGO for the Minas Tirith Battle LEGO set to share with you. To get it looked at seriously by LEGO he just needs a minimum of 10,000 votes. So if you think this set looks as cool as we do, cast your vote here to have this concept set for the Battle of Minas Tirith designed by JediPippin put into production. The mightiest and fairest of all the Elves that remained in Middle-earth – Galadriel. 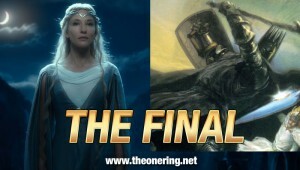 Over 2000 votes were cast in our final event, and Galadriel took 66% of the vote – a significant victory. 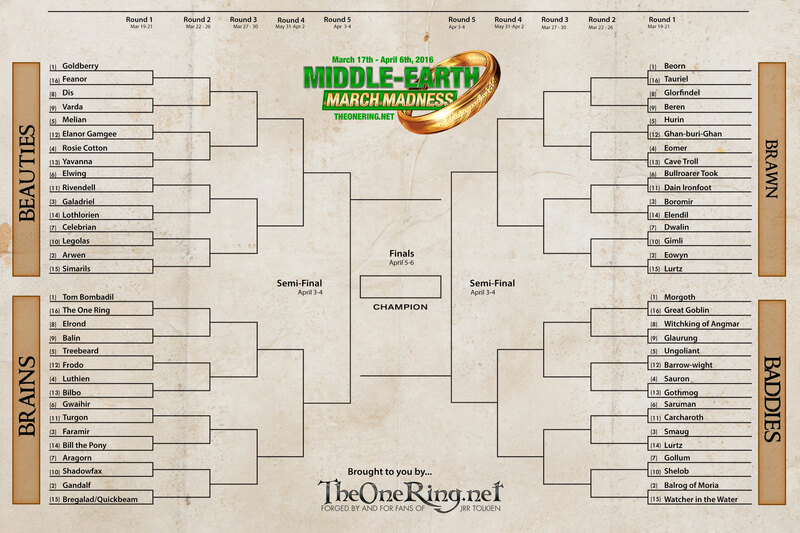 We hope you enjoyed our unique twist on Middle-earth March Madness this year, and as always, we’d love to hear your comments and suggestions below. Do you have a unique way to run this event? Let us hear about it! A note on how the bracket combatants were determined. TheOneRing.net created a document containing all combatants, sub divided into divisions. We asked staff to cast sixteen votes per division, with the votes having a weight of 1-4. Each staffer cast four 4 votes, four 3 votes, four 2 votes and four 1 votes in each division. We then totaled all the votes from each division to determine their rank, and ultimately placed those into our bracket for seeding. Middle-earth March Madness Final – Morgoth vs. Galadriel! Choose the champ! Congrats to the Villanova Wildcats as they won the ‘real’ March Madness last night. But while that was possibly the most dramatic ending in college basketball history, it pales in comparison to our final of Middle-earth March Madness 2016! Could there be a more epic battle? Beauty and Brains facing the ultimate Baddie with Brawn. Voting was close for the winners of the Beauty and Brains divisions. 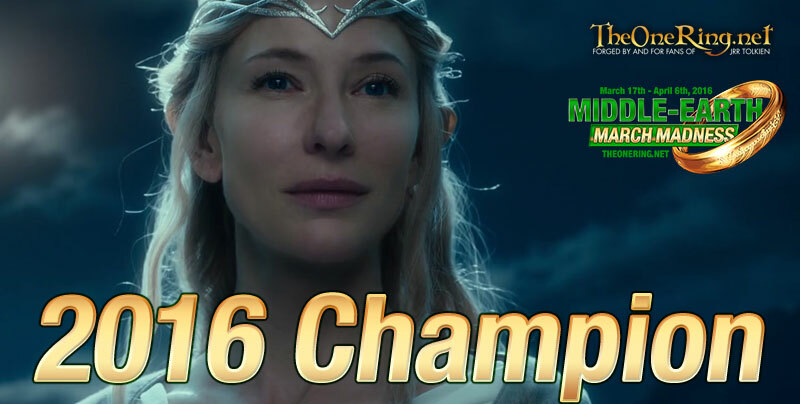 Galadriel pulled out of the victory over last year’s Champ by only 50 votes! Unfortunately for Beorn, the other match-up was not quite as close. Morgoth blew-out Beorn, garnering 60% of the votes. So it all comes down to this. Will we have our first female character champion? Will an ultimate baddie win for the first time? Only time, and your votes, will tell! Voting is now open below. Voting will remain open until tomorrow night (April 6) at 10pm ET. 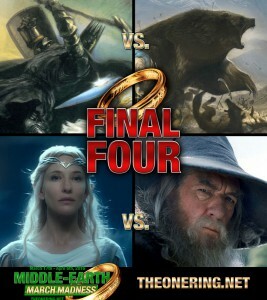 While the NCAA Men’s Basketball Tournament may have set their final last night, we at TheOneRing.net are getting set for our Final Four match-ups! The winner of the Beauty division, Galadriel, will take on the two-time champion from the Brains division, Gandalf. In the 2012 edition of Middle-earth March Madness, Gandalf defeated Galadriel in the Elite Eight round…can he do it in 2016? If Gandalf wins this year, he will be our first repeat champion and will lead the total championship count with three. On the other side we have two first time Final Four combatants. Defeating Eowyn by just 9 votes, Beorn wins the Brawn division and moves on to face the ultimate Baddie – Morgoth! 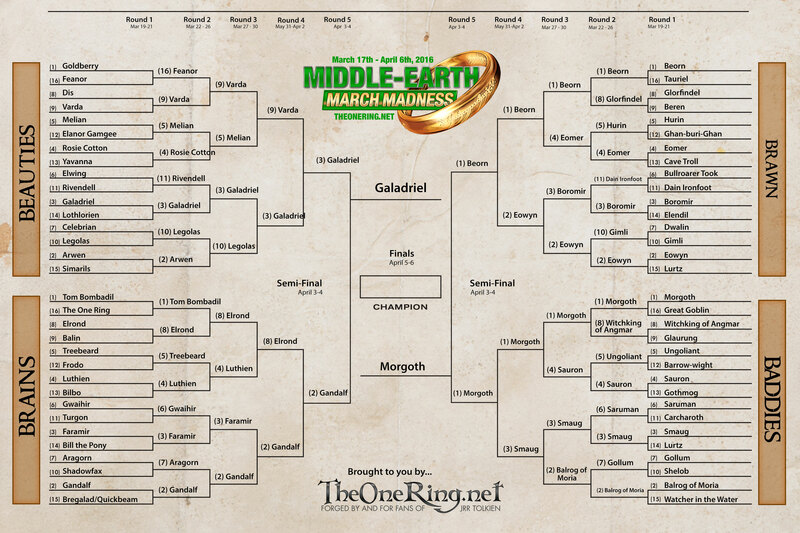 As an interesting side note, this is the first time Morgoth has made any type of run in Middle-earth March Madness. He has soundly defeated all combatants in this year’s event, but he is coming up against the top seed from the Brawn division in the form of Beorn. (Speaking of, which ‘form’ will Beorn take in this match-up? We’ll let you decide.) It’s an ultimate battle of two number 1 seeds…let’s see who wins! The Elite Eight – Middle-earth March Madness – Vote! There are some big names in these four match-ups that will determine each division winner. Who is more beautiful? (3) Galadriel or (9) Varda?! How can one choose. This reporter believes Galadriel will pull out the favored victory based on name recognition alone…but is it right? In the Brains division we have two popular characters head to head…(2) Gandalf vs. (8) Elrond. Seems like a match-up that could go either way. The Brawn divison as the two top seeds facing off for bragging right. (1) Beorn vs. (2) Eowyn. And last, but not least, the Baddies division has the top seed, (1) Morgoth, facing fan-favorite (3) Smaug. Should be a match-up for the ages! A TIE! 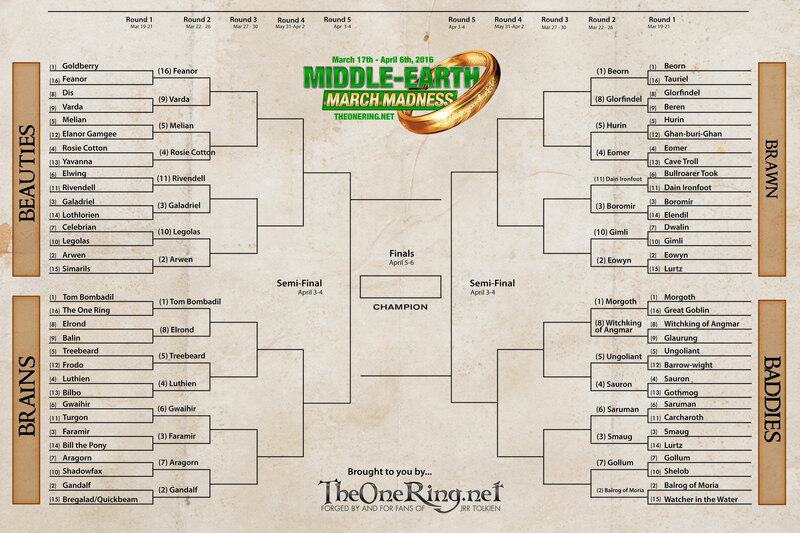 The Sweet Sixteen is Set – Middle-earth March Madness – Vote! Hold the presses! The Sweet Sixteen has been set, but not without a bit of controversy. For the first time in the storied history of Middle-earth March Madness, we’ve had a tie – yes, a TIE! In the Beauties bracket, the Cinderella story (16) Feanor tied with (9) Varda when voting ended at 10pm ET today. To solve this tie-breaker, we decided to randomly pick one to win…no no, we wouldn’t do that. Instead, we did something a bit more logical. We took the total votes from round 1 and 2 and combined them for each contestant. The general idea being, if one contestant got more overall votes in those first two rounds, they should win. After the tally, (9) Varda made it through to face (5) Melian. Should be an interesting match-up! However, one could argue that is not the most interesting match-up of the Beauty Bracket…we have (3) Galadriel facing a fan favorite (10) Legolas! In the Brains bracket (8) Elrond managed to slip by the number one seed Tom Bombadil and will face (4) Luthien. Two of the top seeds, (3) Faramir and (2) Gandalf will face off in the other match-up. Both the Brawn and Baddies brackets are advancing all the top seeds into the Sweet Sixteen. In the Brawn bracket we have (1) Beorn facing (4) Eomer, while (3) Boromir will face (2) Eowyn. Will we have a sibling battle in the Elite Eight?? The Baddies contestants read like a who’s who of bad-arse Middle-earth antagonists. We’ve got (1) Morgoth facing (4) Sauron, and (3) Smaug facing (2) The Balrog of Moria. I only wish we had a couple hundred million dollars and the special effects wizards at WETA to visualize these match-ups for us! 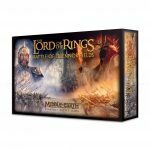 Middle-earth Madness – Round 2 closes soon! 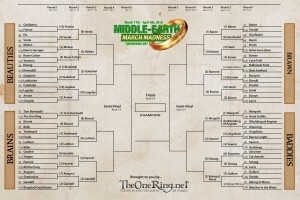 We have some incredibly close contests as we choose our Middle-earth Sweet Sixteen. In the Brains bracket, can (5)Treebeard overcome (4)Luthien, or does (7)Aragorn have a strategy to come from behind and win over (2)Gandalf? (10)Gimli and (2)Eowyn are locked in a tight battle – who will prevail in the Brawn bracket? What about the Beauties (10)Legolas and (2)Arwen? Can anyone defeat (1)Morgoth in Baddies? Voting ends March 26 at 10 PM ET, so pick your winners now! Here’s a link to the poll: Round 2 voting. Middle-earth March Madness – Round 2 Bracket – Vote Vote Vote! Middle-earth March Madness Round 2 is here! With 1000+ votes for each match-up, some of our first round match-ups came down to just 5 votes! In the Beauty Bracket, and with the biggest upset of the tournament so far, (1) Goldberry was beaten by the (16) Feanor! In the Brains Bracket, (6) Gwaihir managed to hold off (11) Turgon. In the Brawn Bracket, the battle of the dwarves was won by (11) Gimli when he took down (7) Dwalin. And in the Baddies Bracket, (3) Smaug decimated (14) Lurtz. Round 2 has its share of interesting match-ups – what are your favorites? 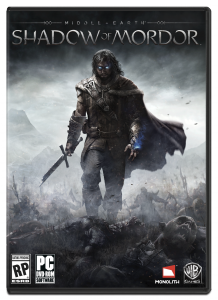 Yesterday, Middle-earth: Shadow of Mordor snared the top prize at Game Developers Choice Awards. Posted in Gaming, Headlines, Video games, Warner Bros.